While searching, filters on data, specifying where to search and where not to search, can be applied. These filtering options are for searching through specific datatypes, as well as a subset of objects inside the current object (ie. a subset of databases of current connection, as subset of tables in current database or a subset of columns in current table). The current filter settings are displayed in the Data Search Tab. To change the filters click on the link 'click to change' and this dialog will open. 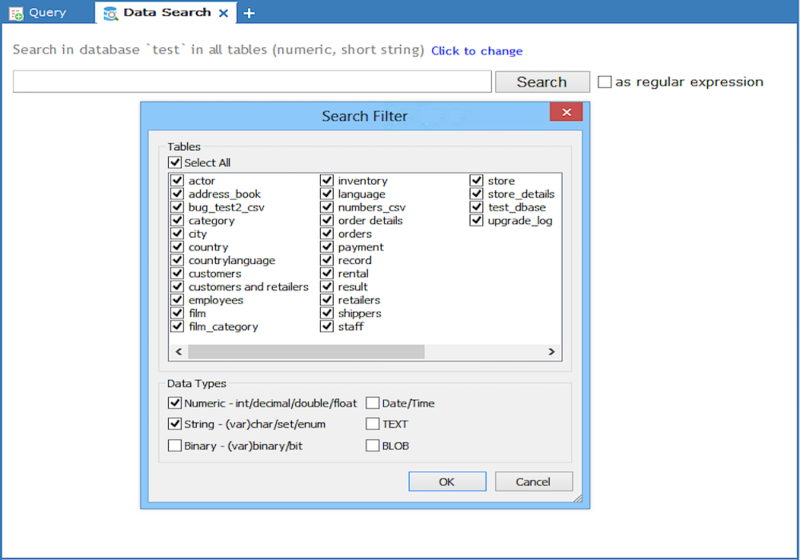 Select what objects and datatypes to search and click OK. The filter setting for datatypes is persistent (both inside current session and across sessions). To search on the BIT type you should preferably use the hexadecimal operator. In MySQL BITs are returned to the client in binary form and searching with plain text - and also not even strings composed of '0' and '1' - does not make much sense. However x'1' will find all instances of a BIT(1) containing "1" and a BIT(4) containing "0001" etc. 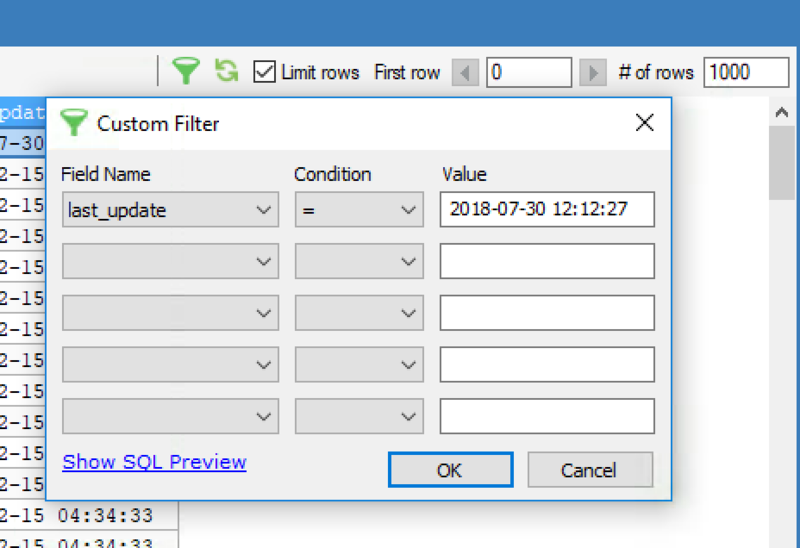 To view the query generated by SQLyog on applying the filters, click on the 'Show SQL Preview' text and the query can be copied manually (Select all and Ctrl+C). 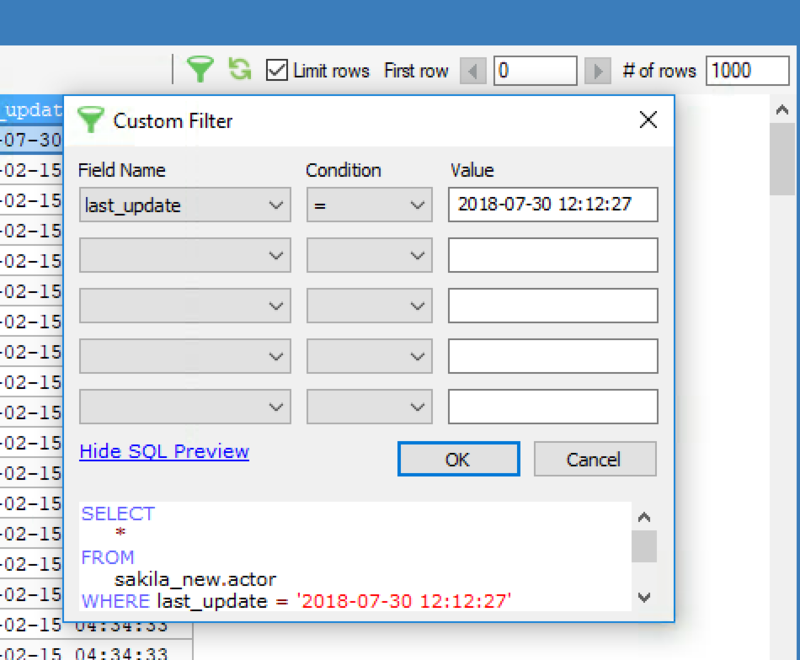 To hide the SQL preview, click on the 'Hide SQL Preview' text.